One of the most difficult tasks for a teacher is classroom management. Picture the young teacher who can't get a grasp on it and quits in frustration. Or worse--the veteran teacher who never got a grasp on it, but continued to teach anyway. Some people seem to have a knack for classroom management. Others have to work hard to hone that skill. I fall into the latter category. If it weren't for the tremendous support system of veteran teachers I've enjoyed over the years, I could have fallen into either one of the scenarios mentioned above. So, I had to work extra hard to "get it." I had to go against my laid back nature. I had to emulate and seek advice from people who did "get it." And I got to be pretty good at it. I still have the occasional issues, of course, but learning takes place in my classroom. And that's the goal. I had been feeling pretty good about my classroom and myself in it for the past few years, and then a new curve ball flew my way. My district went 1:1. 1:1 is a good thing. It has opened up so many possibilities in the classroom. I have kept what works best with pen and paper and embraced what works best digitally. I have blended my classroom. But just when I was feeling comfortable with the old system, 1:1 has introduced all new classroom management issues. The good news is that most of the new issues (the one's I've encountered, anyway) are easily solved with some minor tweaking of the old ways. A blended classroom alternates between technology and traditional pen and paper work. When it's time to work the old fashioned way, there needs to be a procedure in pace for putting away those devices that can be so useful at the right time, and yet so distracting at the wrong time. Without a specific procedure in place and consequences for failing to adhere to it, blending can be frustrating to say the least. My school has adopted a policy for it this year that I think works well, but you can implement one on your own for your classroom. 1. Have a double-sided sign that is red on one side and green on the other. When the sign is turned to the green side, technology is in use. When the sign is turned to red, technology should be put away. 2. If a student is caught using technology when the sign is red, take the device. 3. 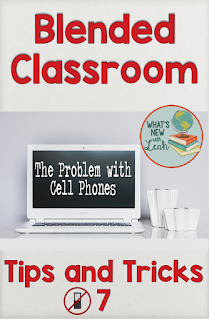 Store the device in a "technology time-out" or a "phone jail" (I used the phone jail before my school adopted this policy, and believe it or not, the students got a kick out of phones "going to jail"). 4. Have other consequences for repeated offenses. Our school-wide policy is an administrative referral, but before this, I would have a progressive policy beginning with a 15 minute detention (I always play opera music in detention--fit the arts in where you can :) ). 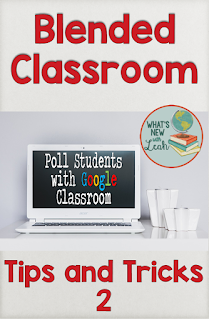 One of the things I love about going 1:1 is being able to tell students returning from an absence to "Check Google Classroom." Technology has alleviated the headache that is gathering make-up work. But what about the pen and paper assignments--the things that students have to cut, fold, and color? Have a specific place where you keep a set of five folders for each class that you teach. I turned plain file folders into envelopes by writing a day of the week on each, laminating them, stapling the sides, and hanging them on my bulletin board (added benefit--I don't have to decorate the bulletin board, a task I don't enjoy). At the end of each class, drop any handouts into the folder for the appropriate day. It's not a novel idea, but it keeps everything in place. Get students into the habit of always checking the folder and Google Classroom (or whatever you use) for the day they missed when returning from an absence. I use tables in my classroom rather than desks. 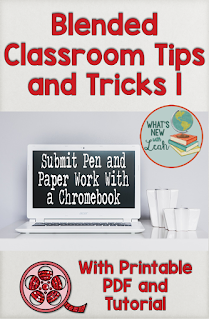 When I was doing all paper-based interactive notebooks, I would keep a bin on each table containing four whiteboards, four dry erase markers, four pairs of scissors, four bottles of glue, a stapler, and a pack of crayons. I know teachers who do this with desks by keeping the materials at the front or back of each row. I found that when it's technology time, not only are the bins in the way, but they can become a distraction (ironically, just like the technology can when it's pen and paper time). So I started keeping the bins off of the desks, labeled with the table or row number to which it belongs and an inventory list. When it's time to use them, one student from each table retrieves the appropriate bin. 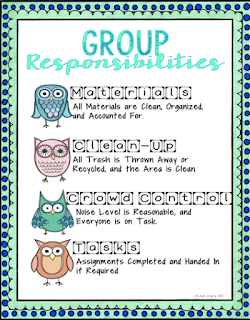 One student is in charge of making sure all of the materials are accounted for and taken care of, and one student is in charge of making sure that any messes are cleaned up. The responsibilities rotate weekly. 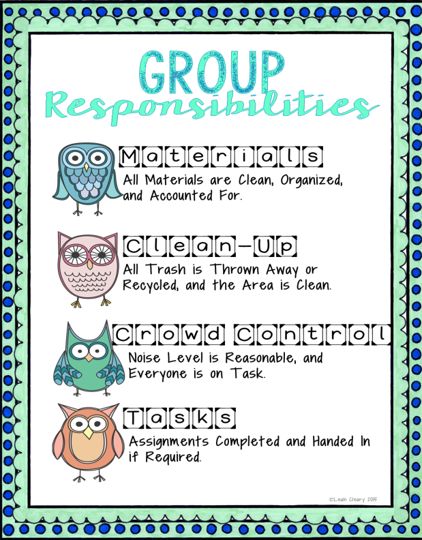 I made this poster for middle school students to remind them of their responsibilities. I use a black and white version in my high school classroom. Those are my three simple tips for making a blended classroom run more smoothly. What are some of yours? Leave a comment below to let me know.